France's finance ministry will introduce special measures to encourage profit-sharing schemes by firms which recorded major profits in 2004. 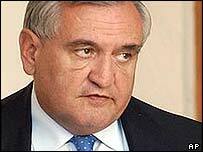 Prime Minister Jean-Pierre Raffarin aired the proposal, which could boost consumer spending, on French Radio J. "We will propose one-off initiatives for 2005 in the coming days," he said. The move is part of a series of measures known as Contrat France 2005 designed to boost the country's economic performance. Part of that project includes moves to increase employee shareholding and other participation scheme, such as the profit sharing. Measures to "encourage special profit-sharing schemes" are set to be announced soon by Finance Minister Thierry Breton. "Some companies have had good results. Those which have had good results must be encouraged to share these," said Mr Raffarin, who did not reveal details of how the new schemes would work. Are France's economic reforms now doomed?